ON THIS DATE (July 26, 2003) ... The scene on the field with John Burkett running out, wearing just a cutoff T-shirt, shorts, and flip-flops, Damian Jackson doing a swan dive on top of the pile engulfing David Ortiz, Manny Ramirez tugging and pushing everyone in a Sox uniform, will be replayed over and over for eternity. Or at least until tomorrow, when the Sox and Yankees play the rubber game of this all-you-could-possibly-ask-for series. But for Jeremy Giambi, who singled, stole second, and scored the winning run on pinch hitter Ortiz's wall-ball single in another last at-bat decision between these teams, a 5-4 Sox win after the Yankees had climbed back from a 4-0 deficit, the lasting memory may be the visit he received in the Sox clubhouse after striking out in the second inning, boos ringing in his ears as he returned to the dugout. Last night Giambi had had his bat broken by Yankees closer Mariano Rivera as he lined weakly to second for the final out of the Sox' 4-3 loss. 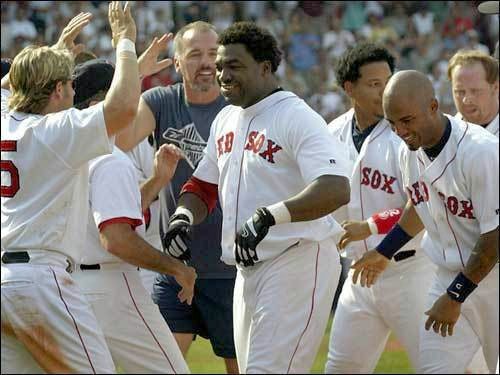 Tonight, facing Armando Benitez, the former Mets closer who has been a Yankee just 10 days, Giambi ripped a 2-and-2 pitch into right field for a one-out single in the ninth, then broke for second and slid safely just ahead of Jorge Posada's throw on a 3-and-2 pitch to Jason Varitek, who swung and missed for the second out. Yankees manager Joe Torre, saving lefty Chris Hammond with extra innings looming and determined not to use Rivera unless the Bombers took the lead, instructed Benitez to walk Johnny Damon, the center fielder whose backhanded, shoestring catch of Jason Giambi's pop fly to shallow center had preserved the tie in the top of the ninth. Sox manager Grady Little, turning to the last left-handed hitter he had on the bench, called upon Ortiz, who fell behind 0 and 2, took a fastball that just missed the outside corner, then launched a ball that struck the wall above the scoreboard in left-center field. Strike up the celebration.